This month Pyramid Lake was an undiscovered pool of beauty, at least to me and my spouse. We just spent three days at this amazing place. We finally saw the big Lahontan Cutthroat after a loud splash alerted us inside our truck while we parked on cliff almost a hundred feet above the Truckee River delta into the Lake. They were a bit hard to see at first. They looked like logs floating upriver. The New York Times just did an article on the growing comeback of these potentially and now actually, big trout. Pyramid is a big Great Basin lake on the edge of the desert. It collects and keeps all the water of the Truckee River that isn’t diverted for agriculture. 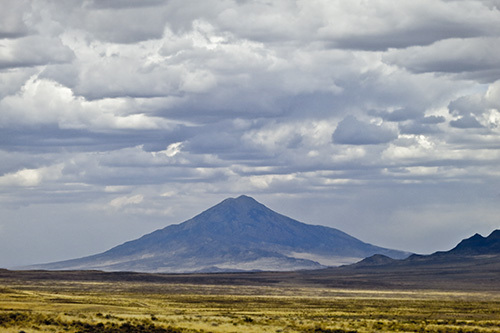 Thousands of years ago, the place it now occupies was the deepest part of Pleistocene Lake Lahontan (900 ft.) which covered much of western Nevada. 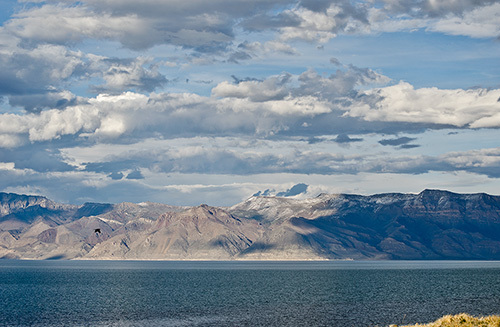 Today its largest remnant, Pyramid Lake, is still over 300 feet deep in places. The Great Basin itself is large area in Western North America defined by having no rivers that run to the ocean or connect with outside rivers. All water drainage is internal. In the ancient, almost-sea Lake Lahontan, a huge sub-species of the cutthroat trout evolved — the Lahontan Cutthroat. When the West was taken and settled, Pyramid Lake and its big trout (by legend up to 60 pounds) remained as well as did the endemic Cui-ui (Chasmistes cujus) sucker, which can range up to 7 pounds. Nevada is a dry state, but many early residents of the state were enthused with the idea represented by the federal Bureau of Reclamation where the government would build dams and diversions to create irrigation projects to “reclaim” the desert. Nevada representative to Congress Francis Newlands championed the Bureau’s creation, and one of its first projects was the Newlands Project that diverted a large part of the Truckee River into a reservoir, ironically named “Lahontan.” From there water was furnished to desert irrigation projects, creating a fair amount of farmland around Fallon, Nevada. Pyramid Lake quickly began to fall and soon the Cui-ui and Lahonton Cutthroat Trout were in jeopardy The later became extinct in the lake when it could no longer run up the now shallow Truckee to spawn. Its demise was aided when and other species of trout, such as rainbow and lake trout were introduced, adding disease and species not well fit for the slightly saline lake. Fortunately some of the Lahontan trout remained in a few other remnant Great Basin lakes such as Independence Lake, California. In the 70s Lahontan strains from some of these sources were reintroduced to Pyramid Lake and they grew to a moderate size, up to ten pounds. However, the giant Lahontan variety was extinct, or so it seemed. Pilot Peak is a tall (10,719′ (3,267 m)) and steep landmark on the Utah-Nevada border, overlooking the Bonneville salt flats. The flats were formed when the second great Pleistocene Great Basin Lake, Lake Bonneville, dried into remnant Great Salt Lake, which is too salty for fish. Where we saw the big trout. Truckee River delta at Pyramid Lake. Telephoto by Ralph Maughan. Copyright. This peak, surrounded by desert and so steep, seems like an unlikely place to find some of the original Pyramid variety of Lahontan Trout. Surprisingly though, small Lahontan trout of the thought-to-be-extinct variety were discovered in a small creek on the mountain. Some were taken, and just in time, because a wildfire has since cooked the creek. They were planted into Pyramid Lake in 2006 and already a 24-pounder has been caught. Ralph – Thank you for the post, it is nice to hear some positive news. There are times when I get frustrated with the fly-fishing “industry” here in Colorado because the focus is on brown, lake and rainbow trout rather than providing fisheries for the native cutthroat. There is even a kokonee salmon run on the Gunnison River using Blue Mesa reservoir as the “ocean”. I am sure you are aware of how the lower dams on the Colorado River have endangered other species such as the Humpback Chub and Colorado Pikeminnow. Do you know, perhaps, why Pyramid Lake remains fresh water (or, at least fresh enough for trout) while many other Great Basin lakes are salty due to evaporation and concentration of minerals? Pyramid Lake is salty and alkaline. It is about 1/6 of the salinity of sea water. Ken Cole is right, but I wonder why it isn’t tremendously salty like the remains of Lake Bonneville in the Great Salt Lake. Perhaps it is because of Pyramid’s depth, but why there such a topographic depression there, and hence less evaporation? I need to consult some geology. Ralph, I know that much of Nevada is considered basin/range country. Here is a link that describes the geologic hisotry of the area better than I can. Generally, the earth’s crust is forming a rift, or crustal extension that is causing numerous faults in the area to lift some land (ranges) and depress other land (basins). I’m guessing that the lake sits in a deeper than ordinary basin, seeing that to the west are the Virginia Mountains and to the east are the Lake Range. Both ranges trend north/south like most in Nevada. Information I found on Wikipedia suggests that Pyramid Lake has 10% of the surface area of Great Salt Lake, but 25% more volume. Less surface area would lead to less evaporation and hence less salinity. The natural world never ceases to amaze me! I grew up in western Oregon, and until I went in the military after high school I was a very avid angler — steelhead especially. 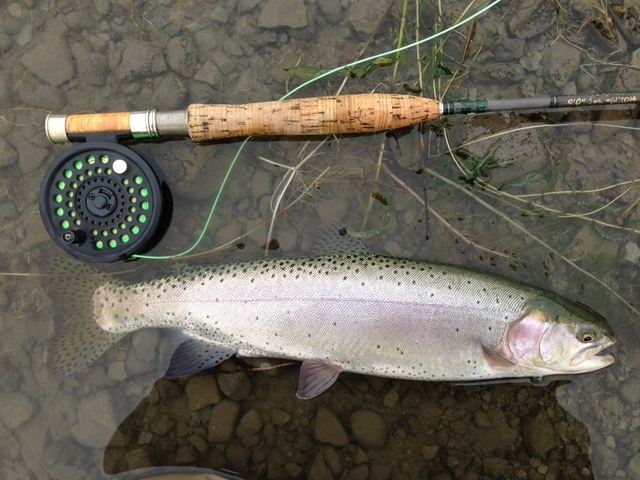 Steelhead are anadromous (sea-run) rainbow trout. Most of the streams in western Oregon had runs of sea-run cutthroat, as well. I don’t pretend to be a biologist of any stripe, but it stands to reason (to me, anyhow) that the Lahontan strain of cutthroat should be able to stand some degree of salinity as well; with Pyramid Lake being their “ocean”, and then running up the freshwater feeder streams to spawn. I think the cutthroats that are anadromous have a lot higher tolerance of salinity. They osmo-regulate faster. But I am no expert either-yet. I wonder if the LCT gained its size in Pyramid Lake or in ancient Lake Lanhontan? CSPS focuses primarily on rainbow, and a few other species. There is only one trout native to Colorado with a pure genetic line, the Greenback Cutthroat. It is existent in a 4 mile stretch of Bear Creek. If CSPS managed Colorado waters strictly for native cutthroat-you wouldn’t be fishing. Cutthroat are more susceptible to pollutants and human pressure. However, a large portion (I believe equal to or greater than browns) of trout raised for release in Colorado are a Colorado River Cutthroats(not a Colorado original but a lineage of Snake and Yellowstone Cuts). The distinction between CRT and GCT was noted by a post doctoral student Jessica Metcalf (CU) and it was discovered that we had erroneously flooded our state (CO) with Colorado River Cuts…easily misidentified for GCT. It is an evolving science and DNA sequencing is bringing us further along. If CSPS didn’t stock fisheries, we would not have them. We have them because of economics and not the good will of men. Sports fishing drives revenue, revenue drives all things American. The plight of the mighty Colorado River is worthy of noting. It is the only large river in North America that never reaches the sea. However, CSPS can only make so many efforts. They are limited by the ever economic water rights policies which have long caused horrible ramifications in many aspects of conservation. The CSPS works diligently (I am volunteering myself this summer) to manage endangered fish. It is a big deal which gets a lot of attention, but all the attention in the world can’t change dry rivers if the rights to water are more valuable to ag owners who don’t even farm anymore. Those rights, are their family’s financial stability. It is also important to keep in mind that while the alkalinity and salinity of Pyramid is elevated in comparison to many other trout fisheries, it is only a small part of the woes of Pyramid. Fisheries Biology is an ever evolving art (yes art). It does seem to run laps around terrestrial management practices. The reality is, early management decisions about introduced species were likely more impactful than salinity (salmonids tolerate salinity is measurements that begin to effect recruitment and egg viability before it causes death in adults). So, had we known much of what we do now, we may have seen the challenges of reproduction and recognized lower productivity in the cutthroat in Pyramid. We likely would not have placed other fish into the lake which would have predated upon, or competed with the natives. Fishing for the cuts in Pyramid is very managed and restricted, which has aided in recovery of cuts. Colorado is quite revered for its’ fisheries and management of them. Blue Mesa is a reservoir, so management is a necessity as it is a human impact imperative. There is a huge management push right now to lower Mackinaw numbers in the lake. The Gunnison river had a biochemical change in the last few decades, and is starting to show signs of rebound. CSPS is working on changing the fish species balances. However, there is a lot of science, money and time required to flip a fishery populous. If you are looking for healthy cutthroat fishing in Colorado, I suggest Haiyaha or Ypsilon in RMNP. Lake Agnes in the Craggs (Mt. Zirkel) or Pearl Lake near Steamboat. Good luck, and happy angling! As far as the article, I think I will pull Nevada’s recovery plan. I’d like to see what went into this recovery as a whole. As for the plight of the Colorado River, lots of folks here won’t understand that from its source, it is subject to transmountain diversion (diversion from the west side of the Continental Divide to the east side Front Range where it is sucked into siphons, huge pumps, and reservoirs where its waters are used by cities like Boulder and Fort Collins, and about 3/4 million acres of irrigated farm land). What remains in the Colorado River basin is subject to more diversion (and controlled by interstate compacts,and is the sole water source for CA’s fertile Imperial Valley) all the way to the California – Mexico line, where Mexico takes more than it is allowed under international compact, basically leaving the river bed empty as it enters the Pacific Ocean. And, as a footnote, the Colorado is subject to high salinity levels owing to the natural geology over which it flows (uplifted seabeds), and the re-use of water for agriculture, in which surface and subsurface return flows leach even more salts out of the sedimentary layers through which it flows. Alot of water is lost through evaporation in the arid air over the on and off stream reserviors and agriculture. The plight of the Colorado River has been studied to death, with no solution, while the population and water use within the basin has continued to grow. No forgiveness needed. I get lost in all the initials myself. Colorado State Park Service. I recently read a bit more (depressing read) about the Colorado. Although collaborative efforts are being made to bring it back to life in Mexico, the water that actually reaches Mexico is almost non-existent. It’s use in California for agriculture is only part of the issue. It is also used for aesthetics. It is wasted and squandered as one of the most dammed rivers in the USA. The solution to the problems and peril of the Colorado rest solely on the backs of humans. I have lost a lot of faith that those solutions can even be found. People have to choose to be aware and make better use of resources. While we boast progress, I also see regression. It kind of makes me ill.
“Chasing Water” is an excellent watch. The backstory of rashes and concern for toxic exposure to the photographer and his kayaking companion are also compelling. It’s an excellent film that I think high school students every where should have to watch and then watch again. Education and truth is over due. Now I understand your use of “CSPS.” I think what you mean is CPW (Colorado Parks & Wildlife), though maybe they do use another acronym. I don’t know when, but Colorado Division of Wildlife was consolidated with its Parks Department in the last couple of years. The “old” Colorado Division of Wildlife, did (does?) most of the research leading up to stocking plans in conjunction with Colorado State University in Fort Collins (which is also where Robert Behnke was a professor). The Warner College of Natural Resources at Colorado State is a leader in such research. Since we are talking about the Upper Colorado River here is a recent study of the CR Cutthroat trout which is at risk, due to climate change (but not as much MORE as one might think because they only occupy a small portion of their historic range due to decades of adverse habitat destruction). They are now lumped together. The wildlife and fisheries research is still handled by the same people. They just don’t have much distinction from the policies aspects under the name. Yes, CSU is still heavily involved with things, particularly forestry and fisheries research. We get to boast some of the brightest researchers in the world. Forestry has been the biggest issue in recent years, and will continue on here, as we deal with fire and all that includes. CSU is definitely more involved in that than other aspects of resource management. However, it seems that more of the management of fisheries and wildlife falls to state division biologists and district managers than CSU these days. (Although a lot of those folks earn their doctorates straight from CSU). I’m getting up close and personal with a lot of the processes. There is no area that is not co-mingled with so many others. There is a growing movement toward privatizing fish cultivation for stocking. We have an increasing number of aquaculture companies here. It bums me out a bit, as I have looked at other states and their management. Colorado is an exception and is a very well run and well staffed system. I just recently assisted with the state’s walleye spawn, did time at hatcheries, and today I get the fun task of pulling gill nets. This summer I am assisting with density counts and endangered species research projects. I’m also interning at the National Wildlife Research Center, which works with CSU, APHIS, and so many other groups. I am finding there is rarely an effort that is not in collaboration with many other entities. I am excited to learn as much as I can before I do my fall duties as a seasonal ranger up at Rocky Mountain National Park, where I will be protecting ‘people from elk’ while not in classes in Fort Collins. I learn so much every day, I am beginning to wonder if my brain can retain much more! It sure is a highlight when folks such as yourself share your insights with me. Thanks! p.s. When I referred to CDOW, people younger than me stared blankly. (I am a non-traditional student). I like the old name better, despite the politics involved. Look for papers by Dr. Eric Feathermen and Dr. Jesse Lepak. They are doing brilliant things! I met Dr. Lepak yesterday and was lucky enough to chat with him after class. Feathermen is one of the people who’s research I admire and his passion for his research is unparalleled. Any chance you were pulling nets at Horsetooth,Carter or Boyd Lakes? Ah, and it looks like you are a “fish squeezer” AND a “turd counter,” to use parlance of the respective fish and wildlife disciplines. Today I am pulling nets at a conservancy area called Swift Ponds. We do research there for my Ichthyology class. Ha, I squeeze to give back. I count turds only when required. I am on the fence between epidemiology and environmental communications. I can fix diseases, or I can fix minds. Both are worth while and difficult. I used to work in (it is almost like using foul language) Health Care Administration. But I decided working with wild animals was safer and better for my mental health. I can tell ya, Horsetooth seems to be doing remarkably well given sediment from fires. They really need to figure out how to get Carter’s walleyes to get bigger, and Boyd is going to be pretty close to dry this summer, from what I understand…..and SADLY, Spinney is closed and there is some construction going on. They are trying to boost trout numbers there. I hope the construction and closures don’t impact the Dream Stream. I think there is an aquatic nuisance issue too. I am reading Thoreau’s book about wild fruit now, and he mentions Baron de Lahontan’s (Louis Armand de Lom d’Arce) books, cause he was describing the early landscape. I’d never heard of him. I sorta guess that’s where the common name (from Lake Lahontan) comes from. I’m not sure Lahontan was ever anywhere near this area though – maybe the name just honored him for some reason I don’t know about. Or it’s from somewhere else completely. Scientific name (Oncorhynchus clarki henshawi) doesn’t mention it. Mark Twain mentions the fish in ‘Roughing It’, from Lake Tahoe, where we also failed miserably. I forget what he called them. It’s the fish of dreams, and of failure. Something besides more failure is welcome. To add a little more to it, here is a podcast from renowned trout researcher Dr. Robert Behnke, a retired professor of fisheries at Colorado State University. He did his doctoral work on the Lahontan in 1957, while a student at U California Berkley. About 7 minutes into the interview he discusses the Lahontan of Pyramid Lake, the history of the genetics, and the up to 18 inch “tui chubs” the big Lahontans used to feed on. He also developed the criteria by which NA salmonids could be taxonomically classified. Later in, he is critical of what he calls “environmental extremists” or “zealots” who interfered with the ability to make simple and economically efficient fish transplants using electoshocking equipment and a bucket, or the use of rotenone for invasive erradication purposes. Conservation biologists, among others, will enjoy this interview (though the interviewer is a bit of novice). I had the good fortune of knowing Dr. Behnke in the late 1970’s, when he was studying distribution of the “greenback cutthroat” trout in Colorado. Excellent! And lucky you…he is a definite pioneer in his niche! I knew Bob Behnke in the late 1950s when we were both students at UC Berkeley. He was totally obsessed about trout. I knew another fishery biologist, recently deceased, who saw nothing wrong with eliminating native fish from streams so they could be replaced by trout. Good article Ralph……TU spent years working on the restoration of LCT. Great concise concentrated overview of the very complex and politically tangled history of the natural wonder that is Pyramid lake. Born 1961 in Northern Nevada I have spent ten’s of thousands of hours fishing Pyramid Lake and studying it history first hand. The re introduction of the original strain of LCT is very exciting to say the least. It is also at the same time already falling victim to the same political arrogance that caused it first demise long that caused. We that love this fish need to become aware and involved in it existence or it will once more be gone. Their is much missing to this story and I hope you will continue to explore and report those missing dynamics. Thank you. I am continuing to learn about the promise and pitfalls and history of Pyramid Lake and its fish. Ken Cole, the other webmaster here, is also writing a story about the Alvord Cutthroat Trout. Is there a difference between these Lahontan trout and the ones found in the lakes of eastern Washington? Spent many hours fishing for them in those lakes. Rancher Bob – Lahontan cutthoats in Washington were stocked there, apparently from hatchery fish descended from the few remnant populations in the Great Basin. My dad use to take me to see the Lohontans spawning in Lake Lenore. It was a lot of fun to see them so clearly in the shallow flats. I don’t know when WDFW first started stocking Lake Lenore with Lahontan’s, but it must have begun in the early 1980’s. My first trip there was in 1988, over Easter week-end. Caught several on barbless hooks. If I recall, it was catch and release. They were good size fish (16+ inches), but were not very muscular or energetic (unlike a rainbow), and not a one of them jumped or broke the surface, under line tension, which for a fish with a barbless hook in its mouth is a great escape opportunity. I wonder if Ken Cole’s experience catching Lahontan’s in Mann Lake in OR, is similar? If I recall correctly, you’re right that it was(is?) catch and release/barbless hooks. My dad also felt that they were not energetic, but to a boy my age they were just fine. Could the high level of alkalinity in the lake contribute to lethargy? Nearby Soap Lake is so alkaline that I don’t think there are any fish at all in it. There are however, plenty of Water Boatman. When I swam in that lake you were literally surrounded by dozens of them at any given time. Ralph those may have been carp that you were seeing from the cliff top. I have seen them as well. Years ago I flyfished for them and caught many big ones. From a distance they look like big brown logs in the water. Walker Lake, NV; A Pyramid Lake Lahontan Cutthroat Trout Redux? Gosh, The Lahontan cutthroat of Walker Lake, NV are now going down fast as they did with Pyramid Lake water diversion. Has Walker lake become too alkaline to support trout? Walker Lake is just over an hour’s drive east from Mono Lake in CA. 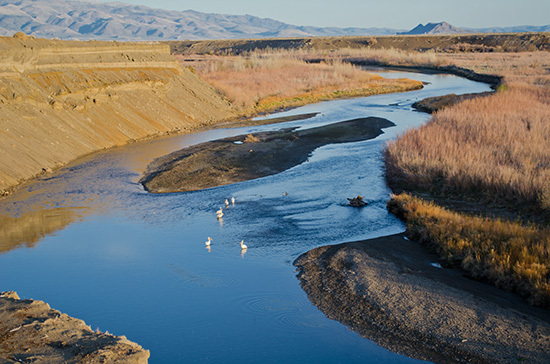 The Walker River water rights are mostly spoken for; so that we may grow the water intensive crops of alfalfa, garlic and onions in the Smith valley, NV. A local fishery may be gone and wildlife area declining. I fished there as a kid and caught some of the cutthroat lunkers on 3″ spoons. The comments are worth reading as well for additional insights. Like Mono and Pyramid, Walker Lake is worth saving for wildlife such as birds and fish, recreation, the local economy and because it is not too late! I think the TMDL (total mass daily load) approach may add some hope to save Walker Lake. Dissolved solids and toxic metals are increasing in concentration. Something like 50,000 acre ft. of water annually is needed for lake inflows and a start has been made to buy 6,500 acre ft from willing farmers. A good approach if enough water can be bought. But can enough water be bought in enough time? Walker lake is listed as imperiled by the EPA. What is the state of NV doing to get Walker Lake delisted? We need a coalition of concerned citizens, environmental groups and governments to step up and move forward… likely into the courts if voluntary efforts fail. We need a coalition of groups like Western Watersheds Project, The Center for Biodiversity, the Nature Conservancy, Trout Unlimited and National Audubon to examine past efforts, successes and failures, to get water flowing into Walker Lake. Would TMDLs help save Walker Lake?